If you’re on the lookout for the best toddler drum set to help your little one explore the realm of music, this guide might be of help. Based on toddler drum set reviews and the features of some of the most appreciated products for sale, we have reached the conclusion that the VTech KidiBeats is the first option you should consider. 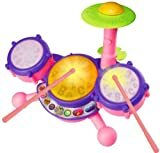 The set includes three drums and a cymbal, has four modes of play, and allows toddlers to play different genres including dance, rock, and pop. In the unfortunate event that this product is unavailable, a reliable alternative in terms of quality is the Battat B. Drumroll. This product will enable you to provide your toddler with some sonic fun and help your little one discover the endless possibilities of drum playing. The set includes three drums and a cymbal that will allow your kid to play various genres such as pop and rock. Ideal for 2 to 5-year-old toddlers, the set also comes with 9 pre-set melodies. The constant background music might be disturbing as some customers who tried the product say. Designed to allow toddlers to explore their sonic creativity, this drum set is great for helping little musicians develop their sensory capacities. Including everything your kid needs to explore the drum experience, this set is easy to use, store, and transport. Therefore, it makes a great choice even for your family trips and getaways. It comes with 7 pieces that are stored inside the drum. The items will help your little one develop creative skills and enhance hand-eye coordination. The edges of some of the pieces included in the drum set may be too sharp as one buyer who tried it mentions. Providing your little one with a variety of ways to play and committed to helping little players develop various skills, this drum set is worth considering. Offering three light-up drums and a cymbal for a full drum experience, this drum set is worth considering if you want to help your little one discover the world of sonic creativity. Moreover, it will help young musicians develop hand-eye coordination. It features four modes including Numbers, Letters, Follow Along, and Free play. Check the measurements first as some customers found the product to be too small for certain ages. Consider this drum set if you want to help your kid enhance and develop various skills such as creative thinking through different genres and sonic adventures. Searching and finding the best drum set for toddlers might be a bit difficult and time-consuming given the various products available on the market. To ease your decision-making process, we have highlighted below some of the most appreciated toddler drum sets. Check them to get one step closer to what you need. If you want to provide your toddler with the fun a drum set can deliver, the first model we think you should keep in mind is the KidiBeats from VTech. Including three drums and a cymbal, this set is ideal for little ones in need of some sonic fun. Every item included in the set comes with a unique sound for sensory development. The drum kit will allow your toddler to play songs in different styles ranging from dance to pop and rock. The set features 4 modes including Letters, Numbers, Free Play, and Follow Along as well as 9 pre-set melodies. Each drum boasts a unique LED light and the set also includes drumsticks so your kid can feel like a real drummer. The toy is great for 2 to 5-year-old toddlers. You will get 3 AA batteries for the demo. New batteries are needed for regular use, though. Another option you might want to check before making a decision is the B. Drumroll Toy Drum Set from Battat. You won’t just get a set that includes everything your toddler needs to explore the drum experience but also a design that enables easy storage and transportation. The set comes with 7 pieces including drumsticks, a tambourine, castanets, and a shaka-shaka egg that can all be stored inside the drum. This way, you can easily take the drum kit with you when traveling, and given the variety of the instruments it includes, your child will be free to explore music in many different ways. The set is ideal for children aged 18 months and above. The items included in the set will help your little one to think creatively, enhance hand-eye coordination, and even develop social skills. Even if there are so many pieces, the set weighs only 3 lbs so you can add it to your travel gear with ease. Help your toddler discover the world of sounds and explore various ways of becoming creative with the Exclusive Pink Drum Set from VTech. Designed with your kid’s fun in mind, this set comes with three light-up drums and a cymbal for a full drum experience. 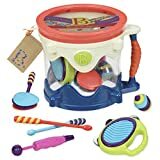 Just like a real beginner drum set, this toy kit will help your little one develop and strengthen hand-eye coordination and creative thinking. Thus, each of the instruments included in the set has a unique sound for sensory development. Moreover, each drum has a LED light that will further help children with their sensory development. The set features four modes including Numbers, Letters, Follow Along, and Free play. Your little musician can play along to built-in melodies and try various styles such as dance, rock, and pop or combine them according to their preferences. The set measures 12.1 x 11.5 x 3.9 inches and weighs 1.9 pounds. One option you might want to bear in mind when looking for an electronic drum set for your toddler is the Electronic Drum Set with Adjustable Sing-Along Microphone & Stool from Best Choice Products. Including a bass drum, a cymbal, left and right snare drums as well as a stool and a microphone, this set will provide your kid with the experience of a real drummer. Thanks to the volume adjustment knob, your little one will have the possibility to play the drums in both soft and loud noise settings. The set boasts 5 buttons that will play different music in the background. The drum kit also comes equipped with various types of beats and songs your toddler can experience with. The set is powered by 3 AA batteries that are not included in the package and is recommended for 3-year old toddlers. The material used for the pieces you get is plastic. Have you noticed your toddler smile at the sound of your favorite jazz tunes? You might want to give this Huile Jazz Drum a try, then. Designed to help children develop their musical skills, enhance hand-eye coordination, and get creative with sounds, this kit should not go unchecked. The package includes 3 drum pads, 1 cymbal, a microphone that can be moved, a stool, as well as 2 drumsticks. The set combines drum beats, colorful lights, funny melodies, and sounds so your little one can learn and explore a new realm in a fun way. The toy was designed to help toddlers improve the way they pronounce, strengthen their hand-eye coordination, enhance their flexibility, and tickle their creativity. The materials used ensure durability and the colorful design will appeal to your little one’s eyes as well. The item is powered by 3 AA batteries, measures 24.8 x 13 x 24.8 inches, and weighs 5.2 pounds. Make sure you also check the Tap-A-Tune musical toy from Little Tikes before you hit the button and order. This set was built to help preschoolers and toddlers enter the world of music in a fun way that will stimulate their imagination and help them develop various skills. The colorfully designed drum comes with 2 drumsticks that clip on each side of the drum in order not to get lost. This way, you will make sure that everything stays in place once your toddler stops playing. The players can use the drumsticks or their hands to beat on the drum according to their preferences and level. The product is also safe to use as it does not include tiny pieces. Thus, it is easy to utilize and store. The drum comes with 2 modes of sound and is ideal for ages 1 year and over. It’s also quite affordable, so that’s a plus you may want to consider. Last but not least is the Light & Learn Drum from Bright Stars. Because a kid’s toy must combine a colorful design with a safe construction, this drum set promises to help your little one discover and explore the world of music in a fun and safe way. The little drummer must tap the drum to see lights flash and play music. The item offers 3 play and learning modes. When using the number mode, the toddler can count along with the drum beats whereas, in coloring mode, lights will correspond to the color every time your baby taps on the drum. The drum is, thus, ideal for helping babies and toddlers learn more about numbers, colors, cause and effect. The toy measures only 8.85 x 3.5 x 6.5 inches and weighs 1.28 lbs so you can easily store it or take it with you when traveling or heading over grandma’s for a little gig. Today’s market offers a great variety of educational and learning toys you can get for your kids in order to help them develop various skills and explore different realms and activities. If you’ve already bought a piano for toddlers and other musical instruments but you’d also like a drum set, you need to keep some features in mind in order to make sure you only get good toddler drum sets. We think the first feature to consider, no matter if your budget allows you to buy expensive or cheap toddler drum sets, is safety. No matter the purpose of the toy you get, be it to develop your little one’s skills or just to add fun to your baby’s playtime, make sure you go for a product that won’t jeopardize your child’s health or safety. Therefore, look for drum sets that do not include tiny parts that could easily be swallowed. Also, consider the materials used and the design of the toy. It is best to go for durable items that won’t break into pieces your baby could swallow. Plus, look for an item that has no sharp edges or corners. 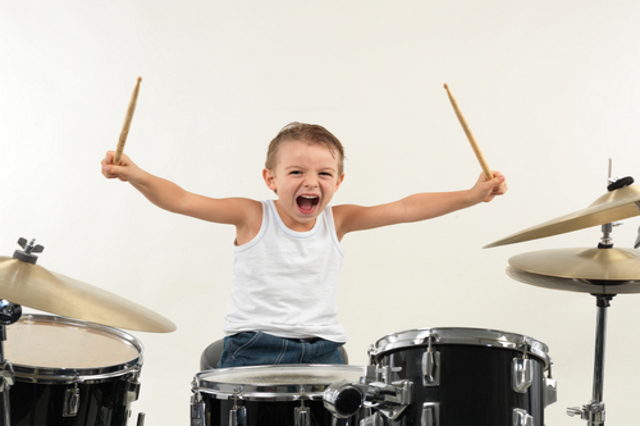 If it’s your toddler’s first drum set, you might want to go for something simpler. You might even consider a single drum toy in order for your little one to get accustomed to this new instrument easily. In case your toddler has already some experience, the market offers drum sets that include various drums, cymbals, and accessories. The more pieces your little musicians get, the wider the spectrum of activities they can engage in. Drum sets for toddlers usually include the accessories your child will need to play such as drumsticks, microphones, and a stool. Even if such a model is a bit pricier, you will get everything your toddler needs to start playing. All drum sets for toddlers should come with information related to the age of the player they are recommended for. They should thus be sized accordingly. Still, if you are not sure about it, you can check the dimension information in order to make sure that you get a set that your little one will feel comfortable with. Such toys often come in vivid colors to attract the little musicians. Go for a drum set that won’t just help your toddler learn and develop new skills but that will also provide your child with visual delight. In order for your toddler to enjoy a full experience, it is best to go for a set that combines various learning and play modes and comes with built-in songs. Let your dear one discover various styles and even create their own. Drums that sport LED lights are even more enticing. Some of them will light when the player taps on the drum and, thus, very young drummers can learn more about colors, too. If you’ve found the information you needed, you might want to check our posts on harmonicas for beginners and top-rated models of pianos for kids to learn more about musical instruments for junior players.